Alex cooked me dinner today. Yay! It was easy. I sat on the couch, looking at houses on the internet (we're looking to buy), and then a little while later, dinner appeared!! It was like magic. Delicious magic. Preheat the oven to 350 and bring a pot of water to boil. Spread out the noodles on a cookie sheet, bake until starting to brown a little bit (like 5-10 mins). Alex says it should look 'espresso foam brown', or the color of soba noodles almost, then let cool. Turn up the oven to 450. Cook the noodles in the water in the water according to the package directions (all the brands have different directions), then rinse under cold water. Toss with the peanut sauce. Steam the broccoli until bright green and fork tender, then steam the edamame for a minute or two, then sprinkle with salt. Cube up the tofu. Combine sesame oil and chili oil and soy sauce and black pepper and ginger and garlic powders and cooking wine. Toss the tofu in this, then bake for 10 minutes, flip, then bake another 10 until crispy. 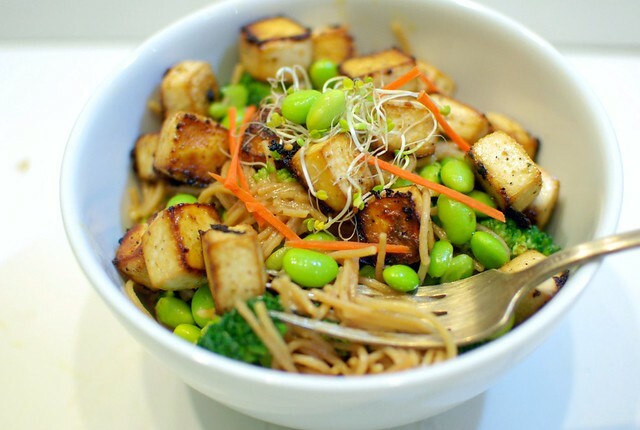 Dump the vegetables over the noodles, add the tofu, add more sauce if you need to, and garnish fancily with vegetables. Sensational. Looks delicious. You are one lucky duck. This is SO my supper tonight! Looks fresh and healthy and yummy! 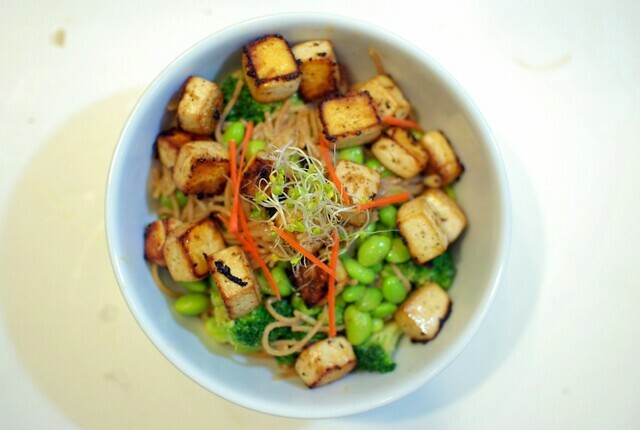 Wow, the colors on this pictures are fantastic, especially green edamame makes me kind of hungry :) Great tofu dish.